Attention. Yandex Browser blocks downloading a malicious file, but it is not a full antivirus product. However, Protect technology defends your browser against computer threats that antivirus programs do not block. We recommend using both for full protection. Files you download from the internet may contain malware or undesirable programs. These programs slow down and block your computer, steal your data, send spam, distribute annoying ads and cause unexpected behavior on browsers. This is why Yandex Browser checks all archives and executable files being downloaded both explicitly and in background mode. As soon as downloading starts, the browser selects certain file characteristics and sends them to the Yandex server for checking. Only the problematic part of the file is transferred, in order to ensure that the security check goes as quickly as possible. During this time, the file cannot be opened, and its icon to the right of the SmartBox is semi-transparent. Malware that has entered a computer slows it down or blocks it, and steals, changes or deletes information. It also intercepts passwords, sends spam and infects other devices in the network. If a downloading file contains a malicious program, Yandex Browser will block it. 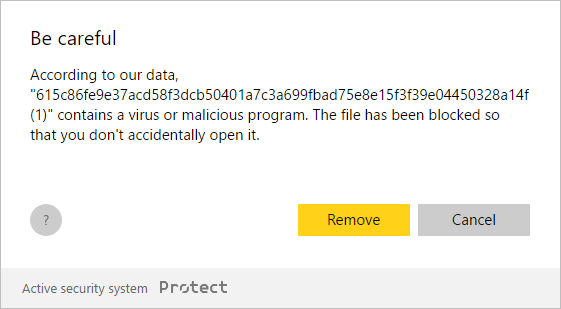 An infected file is marked with the icon , and you will see a warning if you try to open it. The browser keeps files containing malware and adds the infected extension to the file name. The file cannot be opened in this form from the browser or using any other software. This means the infected file can no longer pose a threat, but an antivirus program installed on your computer might still consider it dangerous. Put the cursor on the name of the file to delete and click → Remove from list. Some files and archives install programs and extensions that show undesirable ads, automatically open third-party pages in the browser, or perform other actions without your knowledge after you open them. Yandex Browser considers these files suspicious, marks them with the icon , and shows you a warning if you try to open them. Put the cursor on the name of the file and click → Open. Attention. If you want to disable downloaded file checks, you will have to completely disable protection against malware and malicious sites in the browser. We strongly recommend that you don’t do this. Use a similar sequence of actions to re-enable downloaded file checks.